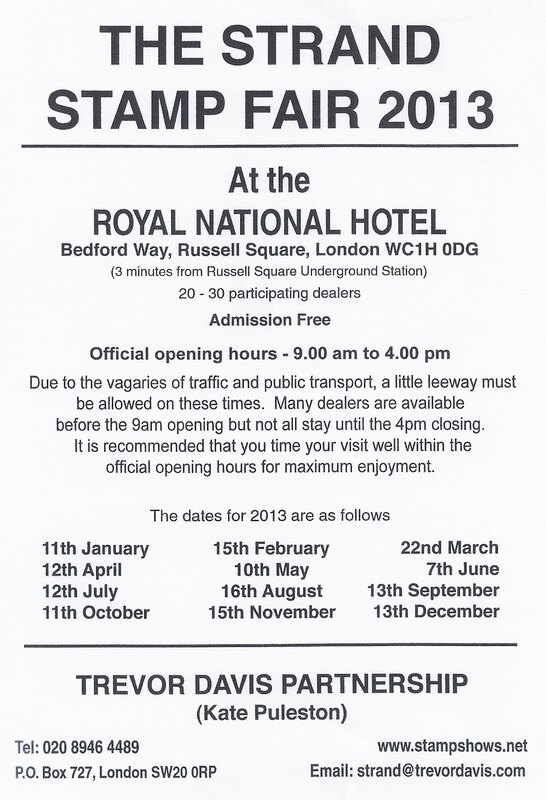 As from November 2012, London's monthly philatelic Bourse, The Strand Stamp Fair, will be held on Fridays - not Wednesdays. 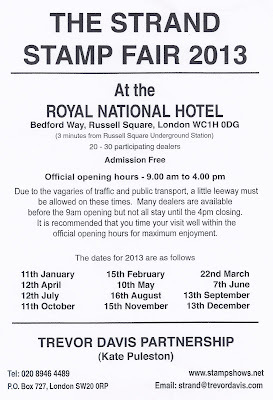 It will still be held in the Royal National Hotel which is just a short taxi ride (or 15 minute walk)from St Pancras International station (OK: I know the unnecessary Border Controls make it less convenient than it could be. Sorry!) and 3 minutes walk from Russell Square underground station. The first Friday Bourse will be held on 23 November and the next on 14 December. The dates for 2013 are shown above. So now you can attend London's leading stamp fair (where many dealers will accept €uros) AND spend the weekend in London!